One of the best things about living in San Diego, among many, is the beach. From where we live, it’s only a few minutes away. Four miles to the sand. Four miles to the Pacific Ocean. Four miles to fresh ocean breezes. Unfortunately, it’s also been 10 years since I actually dipped my feet into the ocean. But just this past weekend, I ventured to the water again, this time for clams. Pismo clams to be exact. Pismo clams can be found up and down the California coastline and if you know where to look, they can be dug up and incorporated into your favorite seafood dish. Harvested clams should measure 4 1/2 inches in width. A maximum of 10 clams per person is allowed per day. Clams can be harvested a half hour before sunrise or a half hour after sunset. 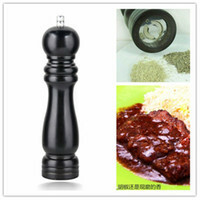 The meat is tender, sweet and delicious when properly cooked. Actually, I didn’t see the last item until writing this post (oops) because all that concerned me when planning this venture was when the tide was low — the optimum time to go hunting for clams. And on this day, low tide was at 10:05 a.m.
Everyone has their own special place to go clamming. 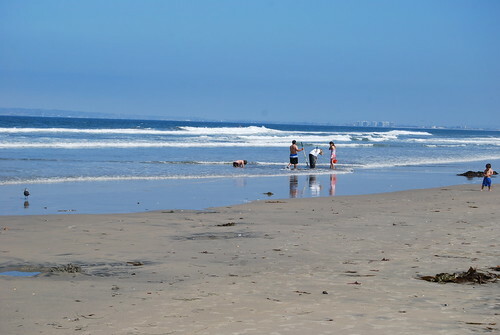 Coronado State Beach is supposedly nice but the $10 entry fee alone is enough to buy 2 pounds of clams at any market. So instead I went near my old stomping grounds: Imperial Beach. It’s the southernmost beach in California; just past that is Mexico. IB has cleaned up in recent years and the crowds tend to be less obnoxious than I’ve seen at Pacific Beach or Ocean Beach and less pretentious, in my opinion, than the beachgoers at La Jolla or Coronado. According to research, clams can easily be found using a rake to scoop mounds of wet sand. But according to my coworker who often goes searching for clams, digging your heels into the sand is another effective way to find them. 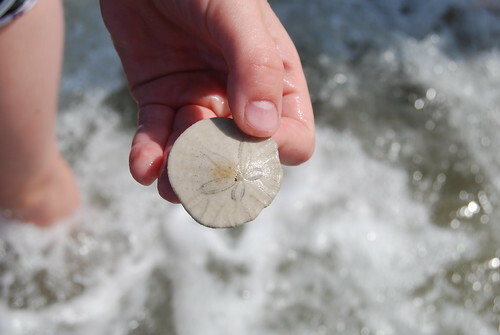 But from what I learned this weekend, finding groups of people with rakes at the shoreline is equally promising, especially if there’s an eager kid only interested in gathering undamaged sand dollars to help us with our mission. A word of warning for the weak of heart: clams are alive straight from the ocean. There was no doubt about this when we were heading home and heard the clams… uh… sputtering… in the bucket. If not frozen or on ice, seafood should always be fresh. And in this case, fresh clams make amazing chowder. With a bit of cleaning to remove most traces of sand, fresh clam chowder can be finished within an hour of returning home with them. Clean clams under running water until sand is removed. Place in a pan with 2 cups of water. Cover and cook for approximately 5 minutes until shells open. Discard any unopen clams. Using a coffee filter, strain cooking liquid and reserve. Pull clams from shells and cut into small pieces. Run clam pieces under running water to remove more sand if necessary. 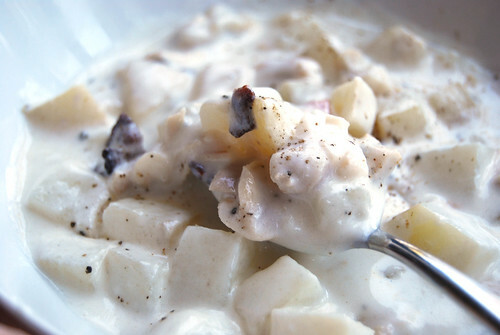 Place potatoes and bacon in a large saucepan and cover with clam broth. Cover and simmer until potatoes are tender. In a large pan, melt butter over low heat. Add flour one tablespoon at a time until blended. Add milk a half a cup at a time, stirring constantly until sauce has thickened. Add sherry. Add clams and potatoes into the sauce. Slowly add clam juice to milk mixture until desired consistency is reached. Heat until boiling and remove. I did not even know you can go clamming in San Diego! I think we’re going to have to do this at some point. Very cool! It’s a ton of fun, if not a bit frustrating if you’ve never done it before so always check if other people are doing it. But being in the invigorating ocean water is part of the allure. I didn’t know you could go clamming in SD either. It seems like fun. It’s a ton of fun! I highly recommend it. 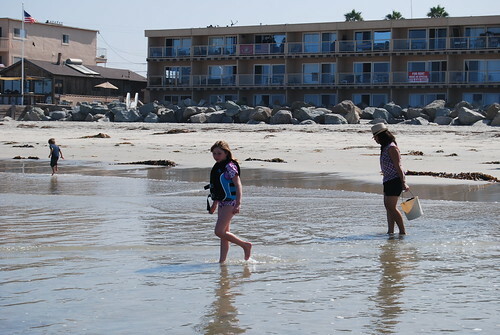 Clamming in SD… man, never thought you could do that! My parents have gone fishing a few times off the pier in IB, but never clamming. I could get into that! And there are a lot of fishermen at IB too — something I’ve always wanted to do. What do your parents catch? that is so cool!!!!! i didn’t know you could clam in san diego. re: pismo clam. in pismo beach, there are giant sculptures of pismo clams (3 different kinds) in town. 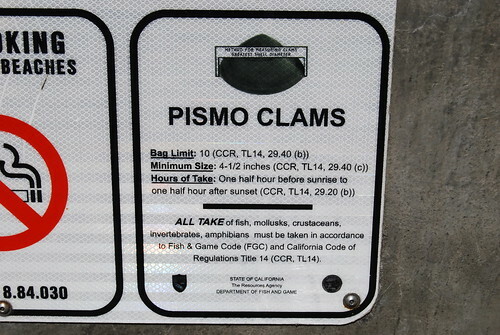 pismo clams are also given a mention in the classic bugs bunny looney tunes episode, “Ali Baba Bunny”. Geoduck look too much like a male body part but coming out of a shell. So disgusting! Thanks!! I’ll look for the Bugs Bunny cartoon. I can’t believe I don’t know it! yeah i didn’t want to mention that specifically but ewwww. i have an old blog post of a visit to ranch 99. i took the nephews and tc there and we were poking the geoducks clams and making it squirt water! Ten years! It’s got to be a record for someone living in San Diego. I’ve never gone clam digging before, but I’m inspired now and I love clam chowdah. Haven’t been to IB since my youngest was born 19 years ago — dang that’s a long time ago — so glad to hear they’ve cleaned up. I can attest to the fact that there’s less pretentiousness in both PB and La Jolla when I’m there because I’m anything but. Now, the clams could be pretentious. Just sayin’. To be perfectly honest, I’m been close to the water either walking on the boardwalk but I forgot how refreshing it was to be in the water. Some parts of IB are still sketchy but it might be one of the nicest unknown beaches in the county in my opinion. We went clamming in Washington but the clams were so big and gross that I didn’t take any home. They weren’t geoducks, but they were about as big as my palm and just looked kinda nasty. Did you worry about the water quality in IB? I would have…. I did have some apprehension about the water quality in IB and checked it up before we went out especially with the close proximity to Mexico. I recall hearing in the last years that the sewer systems in Tijuana have improved. A few days after, neither Paul nor I have suffered any ill side effects. Oh wow!!! This looks really yum! I dont have any local beaches so I guess I’ll have to go clam hunting at the local fish mart! 🙂 Cant wait to, though!! Wow, 15 years in San Diego and I had no idea this was a thing. Totally doing this! I just found out about it myself recently and it’s fun. Hell, being at the beach is fun. Where do I find a clamming gauge in San Diego? The Department of fish and game requires us to possess them while clamming. I don’t know where to find them. What I’ve read is that using rakes with widely spread tines helps to approximate the size of the clams. When is the best time to go clamming? and do you need a license? 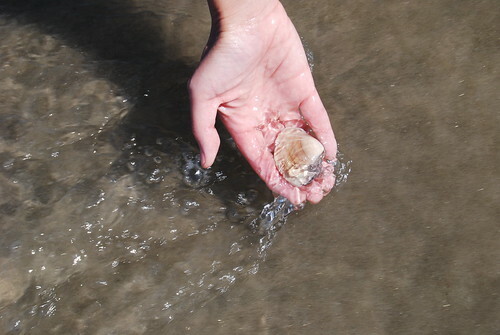 The best time for clamming is late summer. And yes, you do need a license. FYI–The sign says an hour before sunrise TO one half hour past sunset. That means you can go any time during the day between sun up and sun down, not that clamming is limited to two small windows of time during the day. Also, it doesn’t cost anything to go to the beach in Coronado if you go anywhere within the huge stretch between the Hotel Del all the way up to the dog beach. This is kind of a late comment, but the half hour before sunrise and the half hour after sunset are the only parts of the day that you can use rakes to dig up the clams. It said on the pictured sign that the time was one hour before sunrise TO one hour after sunset so are you sure you can’t rake em at noon? Great article. I would love to publish this out my company blog. We sell pismo clam gauges !!!! !